Beachgoers are being urged to look out for precious Hooded Plover nesting sites on our beaches as the ‘Hoodie’ breeding season gets underway. Volunteer Hooded Plover monitors have sighted nests at regular breeding site Point Roadknight and at new breeding site Fairhaven. Dr Grainne Maguire, Project Manager for the Beach-nesting Birds Project at Birds Australia said that Hooded Plovers were classed as a vulnerable species in Victoria, but that new breeding sites indicated that numbers were increasing slightly. “At last count in November 2010 there were 569 adult birds in Victoria, where previously there were around 450,” she said. Torquay Landcare Group volunteer and volunteer ‘Hoodie’ monitor Alison Watson monitors the Hooded Plovers at Point Roadknight daily, which is the Surf Coast’s regular Hooded Plover breeding site. “Despite the many threats faced by the species, there has been an average of two fledgling chicks at Point Roadknight each season and there are currently two nests on the beach,” said Ms. Watson. Great Ocean Road Coast Committee (GORCC) Conservation Officer, Georgie Beale said the new Fairhaven site was an exciting discovery but that it was a dangerous location for the beach nesting birds to breed. “There are two eggs in the Fairhaven nest, but Fairhaven is a dog and horse beach and this poses a significant threat to the vulnerable chicks” she said. 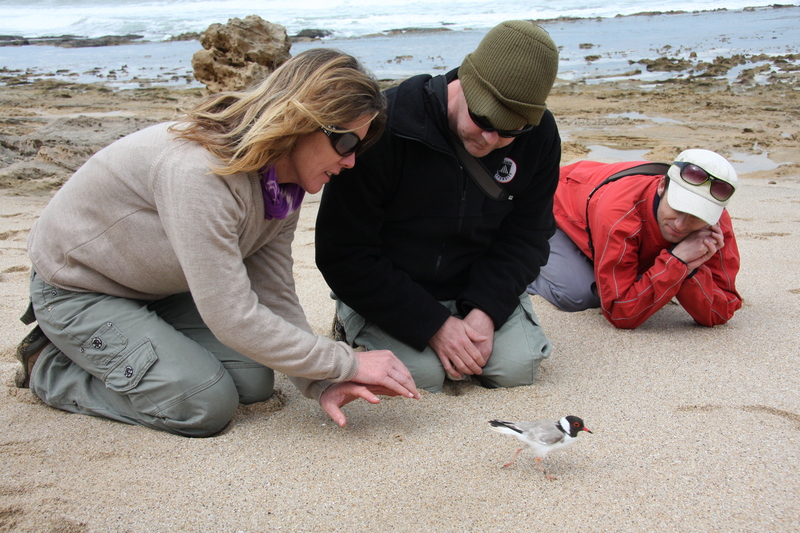 Georgie Beale (Great Ocean Road Coast conservaiton officer), Mike Weston (Deakin University) and Glen Ewers (Birds Australia) release a Hooded Plover at Point Roadknight after branding it. Hooded Plovers breed during the busiest time of year for our beaches making it difficult to protect the eggs and chicks. Ms. Watson said it could be easy to step on the eggs or chicks if people weren’t looking out for them. “It’s important that people walk along the water’s edge as the Hooded Plovers nest around the high tide mark,” she said. GORCC’s work to protect the Hooded Plover includes working with Birds Australia to coordinate volunteers, installing signs to alert people to nesting areas, establishing protective fencing around nesting areas and carrying out regular beach patrols. Ms. Beale said even a disturbance from people or animals could drive the adult birds away from their nests and chicks. “You can help protect the ‘hoodies’ by making sure that your dog is always on a leash on beaches where Hoodies have been found, and by observing the warning signs,” she said. If you would like more information or to get involved visit the GORCC website www.gorcc.com.au , phone (03) 5220 5055, email info@gorcc.com.au or visit the Birds Australia website, www.birdsaustralia.com.au. This column featured as part of the fortnightly ‘Green the Coast’ column in the Surf Coast Times. 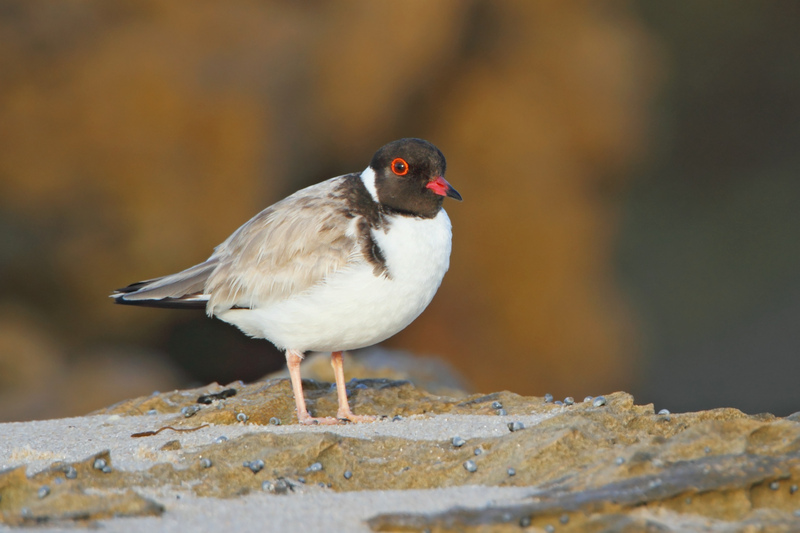 Have you noticed any other Hooded Plovers or Plover nests on the Surf Coast? We’d love to hear from you. People from community groups and government agencies who are passionate about our coastal environment spent the day sharing stories and their ideas for the future. I was privileged to help the Coast Action – Coast Care team at DSE design and facilitate the event. Matt, the state manager of the program, does a great job at nailing the purpose of the forum. And so for this volunteer forum I encouraged the hosting group (Jess at DSE, Gail at GORCC) to plan for a harvest so that we could continue the conversation with the workshop group and people beyond. Another way of sharing (and better understanding) the fruits of our labour was to ‘blog about it’. Rather than create a boring pdf report that no one would ever read, we committed to writing a series of blog posts that summarised what emerged from conversations and group activities. Here are the links to various posts written on the GORCC Blog … (and great work here by Gail Chrisfield of GORCC and Jessica Brown of DSE to bring this to life!) … these are mostly a collection of stories that were shared and explored by group members and now open for anyone to read and comment on.